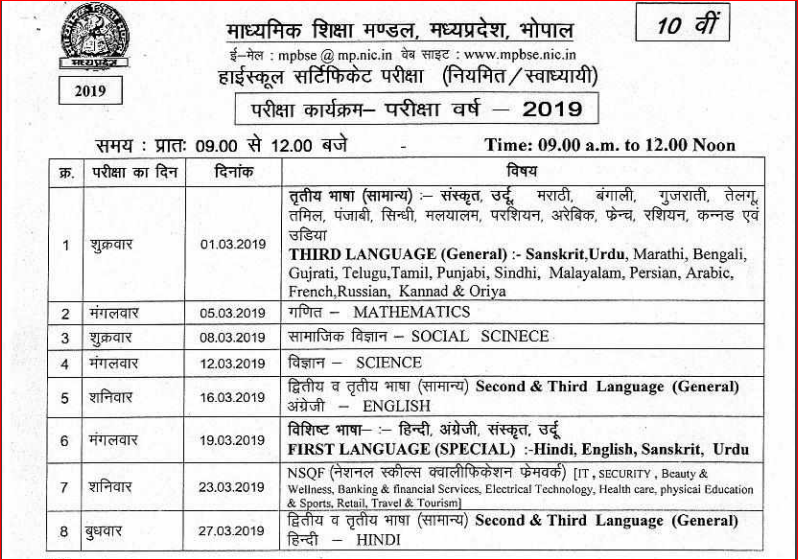 MP Board Class 10th Time Table 2019 has been announced by Madhya Pradesh Board of Secondary Education (MPBSE). MP 10th board Admit Card has been released on 02 February 2019. Students who are looking for the MP Board Class 10th Time Table 2019, can go through the Exam Schedule to get an idea about the time around which the Board Exams could be held and start preparing for the Board Exams accordingly. We had updated the Official Exam Schedule here as the official Time Table has been declared by the Board Authority. The date sheets for Class 10th for Madhya Pradesh Board Class 10th has been announced online on the official website. 10th and 12th Board Exams exams are officially conducted every year by Madhya Pradesh board of secondary education. The MP Board 10th Time Table can easily be checked and downloaded by the students, the steps for which will be discussed in this article. Latest Update: MP Board 10th Time Table 2019 has been released by Madhya Pradesh Board of Secondary Education (MBSE) on 19 December 2018. The examinations have started from 01 – 27 March 2019. MPBSE has released the MP 10th Board Admit Card on 02 February 2019. How to Check and Download the MP Board Class 10th Time Table? The Time Table for Madhya Pradesh Board Class 10th 2019 has been announced on 19 December 2018 as official announcement has been made by MBSE. For the students to get an idea about the time around which they can expect the Board Exams to begin, we are here providing the Time Table. These Dates can help the students to assume the dates and start preparing for the examination accordingly. Firstly, visit the official website i.e. “mpbse.nic.in”. Secondly, on the homepage search for the link MP board Class 10th Time Table 2019. Finally, MP board 10th-time table 2018 will appear on the screen. Also, the Time Table will be in pdf format, the student should download the Time Table. In addition, it is advised to take a print out of the same for future reference. 3rd Language (General)- Sanskrit, Urdu, Marathi, Bengali, Gujarati, Telugu, Tamil, Punjabi, Sindhi, Malayalam, Persian, Arabic, French, Russian, Kannada and Oriya. Madhya Pradesh Board of Secondary Education (MPBSE) was formed in 1965 under the board of Madhya Pradesh Secondary Education Act, 1995. It is located in Bhopal, MP, India. It conducts the various exams like 10th and 12th (regular/private) in both languages Hindi and English. THE MADHYA PRADESH MADHYAMIK SHIKSHA ADHINIYAM,1965 (THE MADHYA PRADESH SECONDARY EDUCATION ACT,1965). DIPLOMA IN ELEMENTARY EDUCATION-I & IIYr (II-CHANCE) EXAM 2018. HIGH SCHOOL/HIGHER SECONDARY/HIGHER SECONDARY (VOCATIONAL)/DEAF DUMP SUPPLEMENTARY CERTIFICATE EXAM 2018. DIPLOMA IN ELEMENTARY EDUCATION-I & IIYr EXAM JUNE-2018. HIGH SCHOOL/HIGHER SECONDARY/HIGHER SECONDARY (VOCATIONAL)/DEAF DUMP/PHYSICAL/DPSE CERTIFICATE EXAM 2018. Read previous year sample papers and practice them to help in preparations. Candidate needs to reach the exam center at least 15 minutes before in order to adjust to the surroundings. Candidates must not bring prohibited/ electronic items like mobile phones, calculator etc in the examination hall.